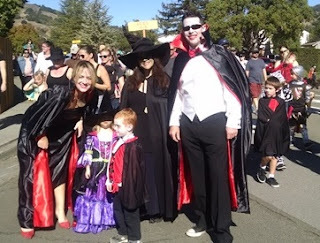 The Annual San Marin Improvement Association's (www.SanMarin.org) San Marin Neighborhood Halloween Parade is scheduled Saturday, October 27th, at 11am. Categories are (0-2,3-5,6-8,9-12,groups/families, and pets). There will be a table set up before 11am for kids, families and pets to register and receive a number for judging. Parade will be led by Novato Fire and will commence on the normal route, down San Andreas, turn right onto San Carlos and finishing at All Saints Church where we will have a Halloween Costume contest. Big shout out to Novato Fire, Novato Police and the San Marin High School students for helping with the parade each year. Many thanks to San Marin neighbor Clint McArdell for stepping up to organize this event for the past few years, San Marin High students for helping, and All Saints church for allowing us to use their ground for awards ceremony each year! This is how we make our community great for everybody! Let your neighbors and friends know and see you October 27th! We are in need of Volunteers - both Adults and High School Students (will receive volunteer hours). Please call Sylvia Barry (415) 717-0293 or email sylvia@SylviaBarryRE.com if you can help!